A beneficiary deed must be lawfully executed and recorded during the owner's life or it has no effect. 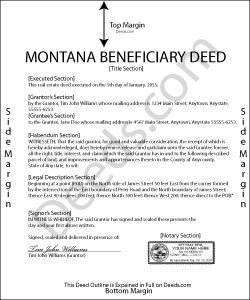 The Montana Legislature enacted the state's beneficiary deed law, found at Montana Code Annotated Section 72-6-121. All following parenthetical references identify the part of that section which contains additional information. Beneficiary deeds are nontestamentary documents (11) that convey a potential future interest in real property, but they only become effective when the owner dies. Until that point, the owner retains absolute title to, control over, and use of the property, including the freedom to change or revoke the beneficiary designation, or to sell the property to someone else (6). If an owner executes and records more than one beneficiary deed concerning the same real property, the document recorded closest to the owner's death is the effective beneficiary deed (8). Note that if the real estate is held as joint tenancy with the right of survivorship, all co-owners should sign the deed or the future transfer might be voided. Review the statute carefully and contact an attorney with questions before executing a beneficiary deed for jointly-held property (4). Grantee beneficiaries are the declared recipients of the real estate, but they have no rights to or interest in it until the owner's death. They gain title according to the owner's instructions as stated on the recorded deed. By accepting the transfer, beneficiaries become bound to fulfill any obligations, including mortgages or financial agreements associated with the land during the owner's life (1). These obligations may also include a claim against the property by the state for Medicaid benefit reimbursement (7). The signature, consent, or agreement of, or notice to, a grantee beneficiary of a beneficiary deed is not required for any purpose during the lifetime of the owner (10). Two or more grantee beneficiaries may hold title as tenants in common, joint tenants, or any other form of ownership allowed by Montana laws (2). Owners may also specify one or more successor beneficiaries in case the primary ones are unable or unwilling to accept the transfer after the owner's death (3). Beneficiary deeds are convenient, flexible tools to include in an overall estate plan, but they may not be appropriate for everyone. Contact an attorney with specific questions or for complex situations. Margaret S. said: Forms & Guide easy to use. It would have been helpful if the counties with identical form packages were identified. I bought two packages when I could have used one. Reply from Staff: Thank you for your feedback Margaret. We have processed a refund for one of your payments. Have a great day. Sharon L H. said: The forms were good enough, hard to get excited about legal forms... The information was very thorough and helpful. Veronica F. said: Im so happy with this site. It was quick and painless and worth the money hassle free if I ever need to settle another deed I will be back. Reply from Staff: Thank you Veronica, we really appreciate your feedback. Jill M. said: This service gave me the information and guide I needed to file a Quitclaim Deed. I went through the process with no problems at all. Reply from Staff: Thank you Jill, we appreciate your feedback.